During the Korean War, prior to leaving China, the CPV primarily were issued three types of canteens: surrendered Japanese WWII canteens; captured Chinese Nationalist Canteens and their own newly made copy of the Japanese WWII canteen. All of these canteens had plug top cap, an aluminum body and a web harness with integral shoulder strap. There are a few variations of the first type plug top ChiCom made canteen. The variations have to do with the color of the paint on the canteen body, green or brown, or no paint at all; whether there are red and gold painted ChiCom markings on the front of the canteen body or no markings; whether the webbing that passes through the plug top comes from the back to front or whether it comes from left to right; whether the metal hardware on the harness is painted or left unpainted plain aluminum; the color and thickness of the webbing; whether the plug top had Chinese factory marking on them or not; whether the canteen is flat or rounded on the bottom and the capacity of the canteen. The ChiComs eventually abandoned the plug top stopper canteen in favor a threaded top canteen with a bakelite screw cap. These early screw top canteens continued to use the first type harness that wrapped around the top of the canteen and buckled in the front. Variations exist in the 2nd type with regard to whether the hardware was aluminum or steel; the color of the cap, the type of hardware etc. As time passed, the ChiComs continued to make screw top canteens but changed the web harness. This second type harness had a webbing which passed along each side of the cap and buckled in the front. 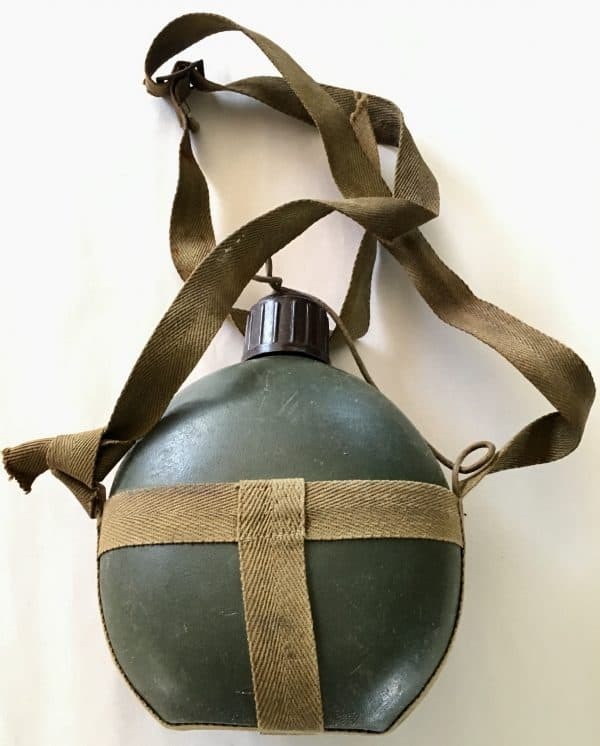 Like the first and second type canteens, there are variations in these canteens such as a harness with a belt loop on the back or no belt loop; whether the cap has any markings molded into it; the color of the aluminum body and the color of the canteen cap. 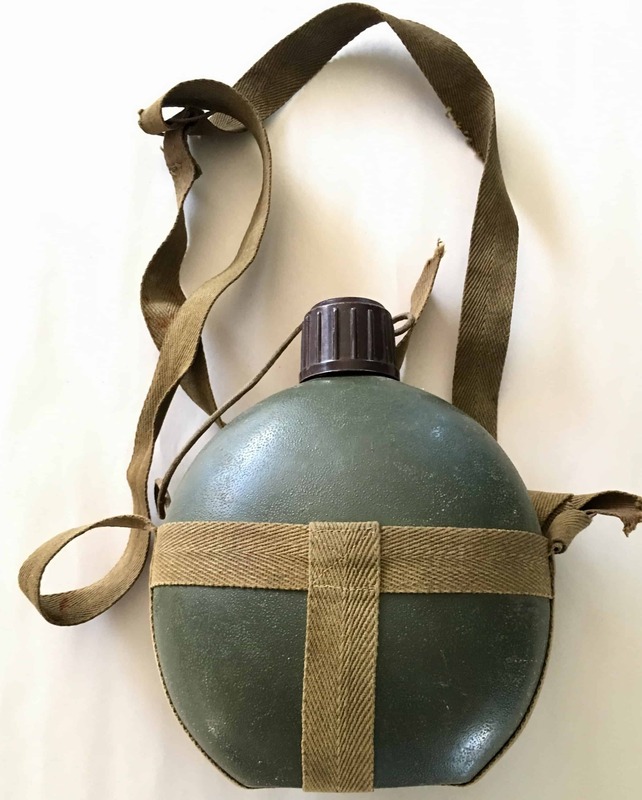 This variation has a screw cap body but a much simpler web harness that passes around the body of the canteen but has no webbing which passes vertically over the canteen to hold it is place. All of these variant canteens were sent to Hanoi as war aide and made their way down South whether they were carried by an NVA down the HCM Trail or were shipped new to Viet Cong Main Force units. The ChiComs made screw top canteens with covers for Hanoi. The cover is a khaki brown twill or canvas and had the cap permanently attached to the back of the cover via a green cord. Replacement covers were also made for Hanoi in khaki brown or khaki green without a screw cap attached. These are just a bit larger than the standard cover as they could be used with captured US made 1 quart canteens. In the early 1970s the ChiComs made canteen covers for Hanoi in kelly green twill with a canteen cup inside. This color is the same as seen on late 1960s NVA uniforms. The PLA is not known to have used canteen covers; this is strictly a Hanoi-export made item. This type was made by the ChiComs in the 1970s and has kelly green split yoke webbing. The cap may be wider and the harness may have plastic hardware and/or no hardware at the end of the split yoke. These were not issued to the NVA and VC but were issued to the Khmer Rouge and Pathet Lao. Because of the subtle variations in the way the ChiComs made their canteens from 1950 to the mid 1970s, one could amass an very large collection of these variants. This is a variant ChiCom made plastic canteen with harness.